The broom hare (Lepus castroviejoi) is a species of hare endemic to northern Spain. 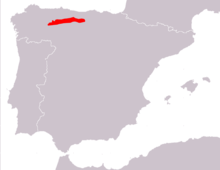 It is restricted to the Cantabrian Mountains in northern Spain between the Serra dos Ancares and the Sierra de Peña Labra. This region is about 230 km (140 mi) from east to west and 25–40 km (16–25 mi) from north to south. It lives in mountains at elevations up to 2,000 m (6,600 ft), though it descends during the winter to avoid the colder temperatures and snow. Its preferred habitat is heathland, containing mainly Erica, Calluna, and Vaccinium, with much shrub cover of Cytisus, Genista, and Juniperus. It also inhabits clearings in mixed deciduous forests of oak and beech. The broom hare body length ranges from 45–65 cm (18–26 in). Its tail grows to lengths of 5–10 cm (2.0–3.9 in). Its front legs grow from 10–20 cm (3.9–7.9 in) and the back legs can grow from 20–30 cm (7.9–11.8 in). The ears can grow to be as long as 18–20 cm (7.1–7.9 in). The fur of the broom hare is a mixture of brown and black, with very little white on the upper part of the body. The underside of the body is all white. The top of the tail is black, while the underside of the tail matches the body in being white. The ears are brownish-gray and are usually black-tipped. The species was only described as distinct in 1976; previously, it had not been distinguished from the European hare. Little is known about the feeding, reproductive, or behavioural habits of the broom hare, but they are believed to be similar to those of the European hare. The broom hare is listed on the IUCN's Red List of Threatened Species as vulnerable. The major threat listed to their status is hunting. Hunting them is excessive in many areas they inhabit, especially when the hares are isolated during the winter. ↑ Hoffman, R.S. ; Smith, A.T. (2005). "Order Lagomorpha". In Wilson, D.E. ; Reeder, D.M. Mammal Species of the World: A Taxonomic and Geographic Reference (3rd ed.). Johns Hopkins University Press. p. 197. ISBN 978-0-8018-8221-0. OCLC 62265494. ↑ Smith, A. T. & C. H. Johnston (2008). "Lepus castroviejoi". IUCN Red List of Threatened Species. Version 2013.1. International Union for Conservation of Nature. Retrieved November 19, 2013.